Guys, including fathers, like to be in control. Especially if they’re not. If your father is in control of your wedding planning, call me. You’ll be the first. In all other cases, any way that you can make your father feel, or even better, THINK that he has some control over this sometimes turbulent multi-month planning process is worth doing. Fathers (and may I say, men in general) like lots of warnings vis-a-vis change. Your getting married is a change. Your asking him to write one or more checks for many, and sometimes tens of, thousands of dollars is big change. Let me say here that your wedding doesn’t have to cost a bagillion dollars, nor does wedding planning have to be a stress factory. It may not even involve any of your parent’s money. In any case, there are things that may come up that, with early action on your part, can be a pleasure rather than a stressor. How much nicer it will be to have family harmony rather than discord! Being a man of father-of-the-bride age, I feel for these guys. Most fathers want to do everything they possibly can for their daughters (and sons), including supporting and being a part of their wedding. While they may not have a lot of interest in the wedding planning per se, knowing that they’re an important part of the whole, even if that just means being apprised of goings-on on a timely basis, can make a world of difference. 1. The sooner your father knows about your engagement, the better. You get double bonus points if your sweetheart asks him for your hand in marriage. Fathers who think they’re the last in the family (or the world) to know, generally aren’t happy. This is especially true if you’re launching right into the planning process, which in many cases will involve a significant amount of his hard-earned money. 2. 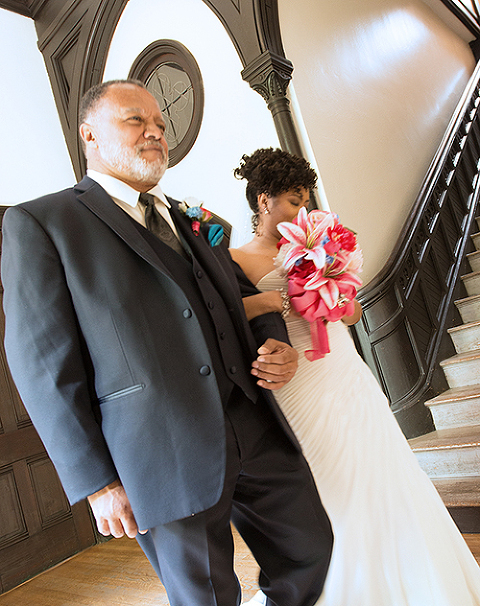 If you would like your father to walk you down the aisle, ask him. This is the one moment in his life that, besides your birth, he will cherish forever. It’s a huge honor. Ask him out loud, clearly and directly, so he can say “yes” out loud. It will mean a lot to him, and probably to you, too. Do it with some ceremony, with family and friends and people who matter present, and do it soon. There will be tears, and it will be wonderful. Don’t forget to say, “thank you”. He’ll appreciate it. You CAN have a stress-free wedding. The planning process is meant to be fun and exciting. Keeping everyone, including your father, in the loop from start to finish can spread happiness all around. P.S. I’d love to hear your thoughts and experiences on this! Weddings that you’d want to attend are our stock in trade. Let’s talk about your wedding, and how we can help you have the wedding you want. Give us a call at 410-727-1112 when you’re ready to start planning.